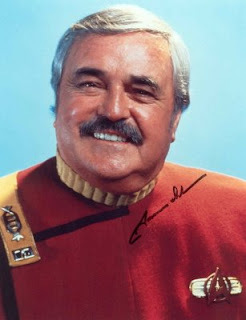 We are deeply saddened to report that James Doohan, the beloved actor who portrayed engineer "Montgomery Scott" in the original Star Trek and seven movies, has passed away. He was 85. Doohan died in his sleep at his home in Redmond, Washington, at 5:30 a.m. local time with his wife Wende at his side. Cause of death was pneumonia, complicated by Alzheimer's disease, according to Doohan's agent and longtime friend Steve Stevens of Los Angeles. Private services will be held in Redmond, but a public memorial will be held in Los Angeles on a date to be announced. According to Stevens, the family will fulfill Doohan's wish to have his remains shot into space on a "Memorial Spaceflight" provided by Space Services Inc. of Houston. Similarly, a portion of Gene Roddenberry's ashes were sent on such a flight in 1997. The date of cremation and of the spaceflight are not yet known. Doohan is survived by his wife of 28 years, Wende, and their 5-year-old daughter Sarah, along with six adult children — Larkin, Deirdre, Chris, Montgomery, Eric and Thomas — and numerous grandchildren and great-grandchildren.